Stapleton. It’s a word filled with emotion and history for those that live in the neighborhood and natives from Denver. 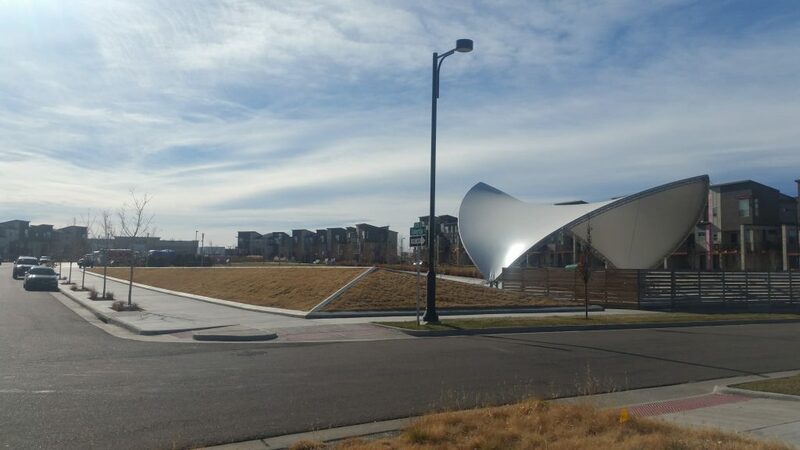 The largest neighborhood in Denver, this landmark spreads from 56th Ave to Montview, Quebec to Havana. It spans I70, contains miles and miles of trails, and houses homes for income-qualified renters to multi-millionaires. Walking Stapleton could take days; instead, we focused on its newer section for just a few miles. To understand Stapleton, we have to go back to the turn of the century when Mayor Benjamin Stapleton was elected mayor. He had a little help from his friends–those of the KKK–who he later renounced after a recall election. The story is complicated, and its one which current Stapleton residents have much angst. Despite Stapleton’s turmoil, he did have the vision to create Denver’s first commercial airport. Despite being “all the way out in Rattlesnake Holler,” that it opened the day after the stock market crash of 1929, and that the aviation industry was fledgling at the time, Denver’s first commercial airfield succeeded and ultimately was named after Stapleton. It flourished, airlines made hubs, and the runways got longer as the airplanes got bigger. The FAA put building restrictions on downtown, Park Hill Neighborhood organized and filed noise lawsuits, and Denver ended up in a quandary about what to do with its overly successful airport. In the meantime, World War II brought in mass developments of armaments and soldiers. The Rocky Mountain Arsenal pushed out tons of munitions, fuel for the space race, and pesticides. A pair of bald eagles moved in; the world’s largest Superfund site got declared; and the airport needed a place to expand. Whew, Are You Following Along? In 1995, decisions were made. Over a billion dollars would clean up the Arsenal and turn it into a Refuge, the Stapleton airport would close, Denver International Airport would open, and the old runways would turn into a re-urbanized, infill development of 30,000 homes. All the decisions have been executed. 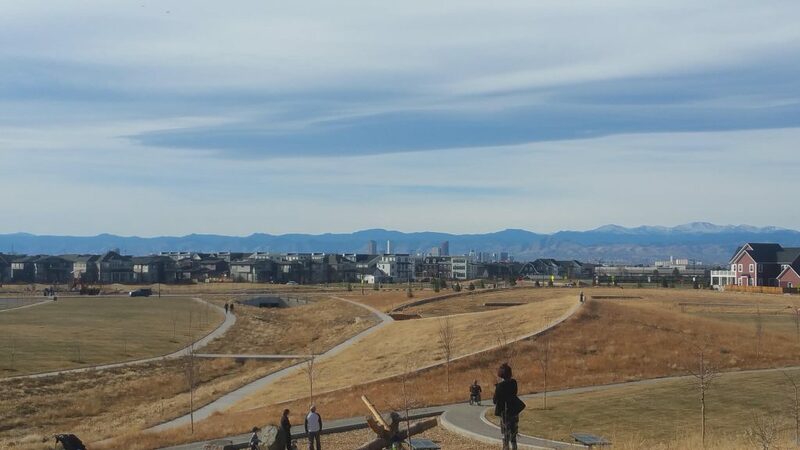 The Rocky Mountain Arsenal Wildlife Refuge flourishes with 126 head of bison, Denver International Airport moves over 190 flights a day, and the Stapleton neighborhood is almost built out. This is where our 2.5-mile walk starts. Start at 4967 Tamarac St. Head north through the linear park, take a right on Stoll Place. In just a few feet, there’s a path that goes north through a strawberry patch and under an arbor. The strawberry patch, grapes, and herb garden are all public access; help yourself to any fruits and herbs. Continue along the footpath and you’ll pass garden plots. These are private and Stapleton residents enter a lottery to be able to plant their vegetables. Pass a tot lot, another set of private garden plots and a natural playground. At E 51st Ave, take a right. You’ll be approximately where the old de-icing field was for the Stapleton airport. Take a left on Uinta, passing from the Conservatory Green neighborhood of Stapleton to Willow Park and through soon-to-be-opened parks run by Denver Park and Rec. At Unita Way, take a right. Take a right on Wabash and then a left on Verbana St which turns into 54th Ave. You’ll be walking along the north side of the park. Cross over Central Park Blvd. You’ll see Northfield High School on your left. Follow the path to the right, making a u-turn to take you back under Central Park Blvd. 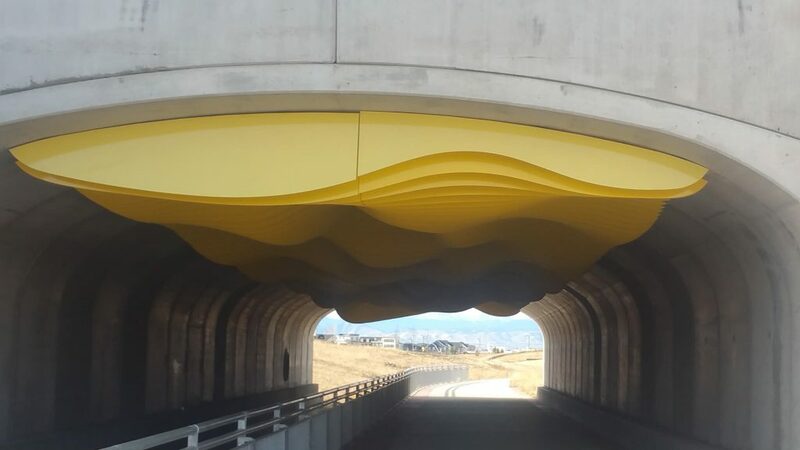 Enjoy “Drift Inversion” by David Franklin as you walk through the tunnel. When you exit the tunnel, stay on the path to the left and then follow it up and around to the high point of the park. Look to the west to catch some great views of downtown and the Rockies. After enjoying the view, wind your self back down the path from which you came, take a sharp right at the bottom to point you westerly. Continue on the path, crossing over the creek and having you cross E Prairie Meadow Drive. You’ll cross into another park at a playground, taking a left to walk southeasterly. 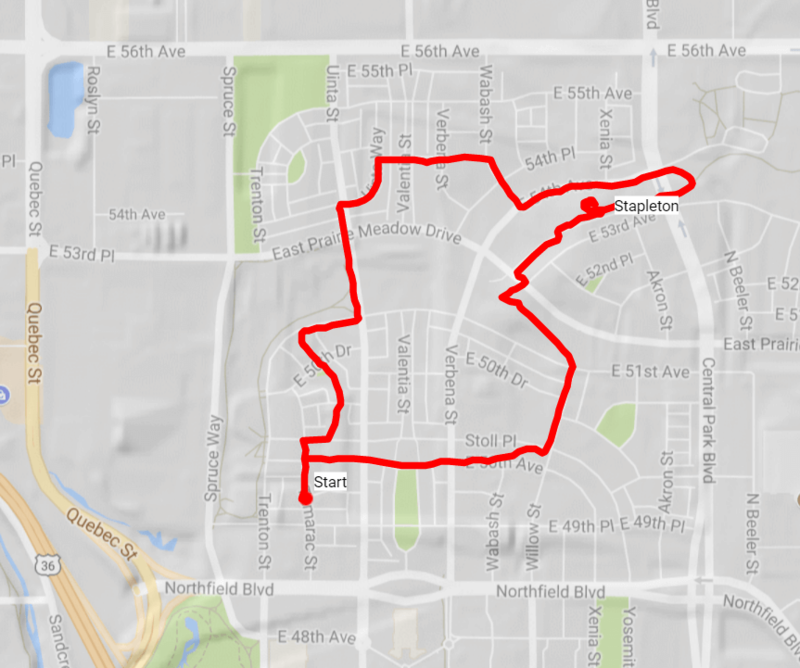 Continue along the path toward 51st Ave, crossing it to go southerly along Willow St.
Cross Stoll Place into the linear park, turning westerly and passing High Tech Elementary and DSST: Conservatory Green. Continue to Tamarac St. Take a right. 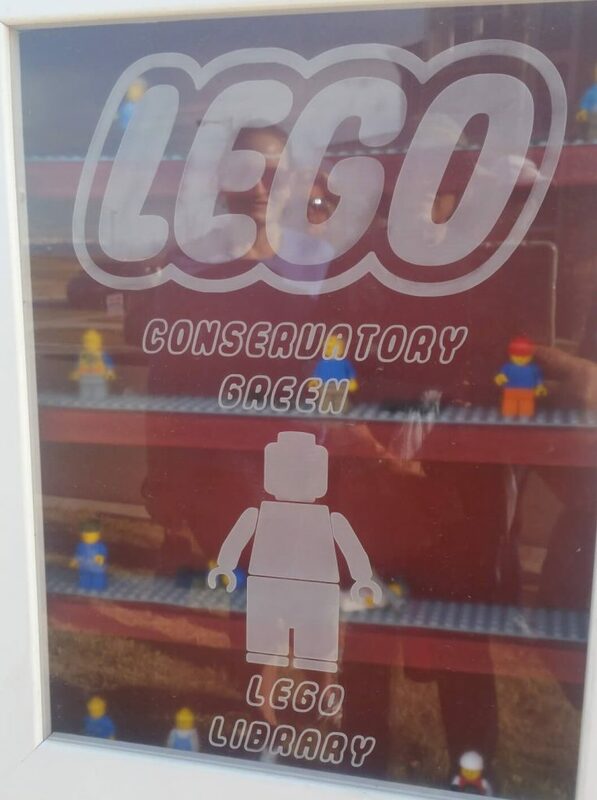 Pass the world’s only Lego Lending Library (that we know of!) and return back to your start. 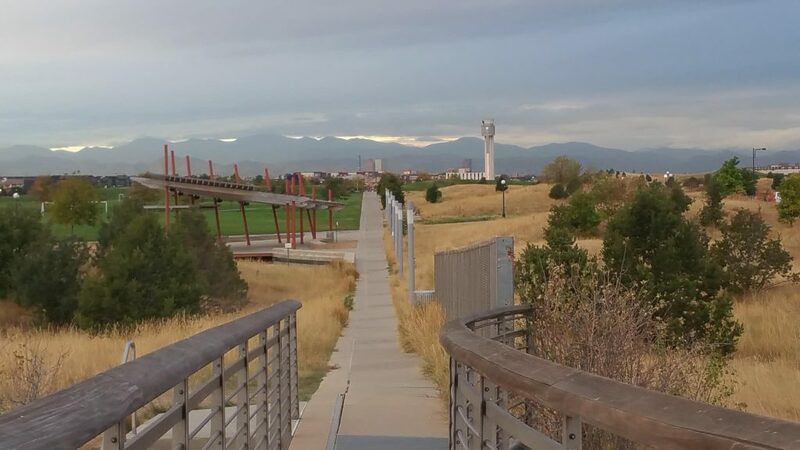 If you would like more places to walk in Stapleton, there are 3 more routes in The Best Urban Hikes: Denver plus two in the Rocky Mountain Arsenal Wildlife Refuge and a bonus one at First Creek at DEN Open Space. 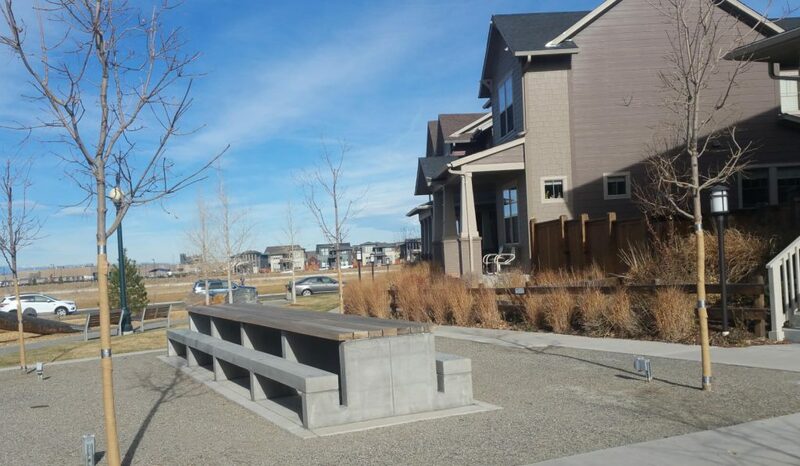 If you liked walking in Stapleton, post your reasons why below!